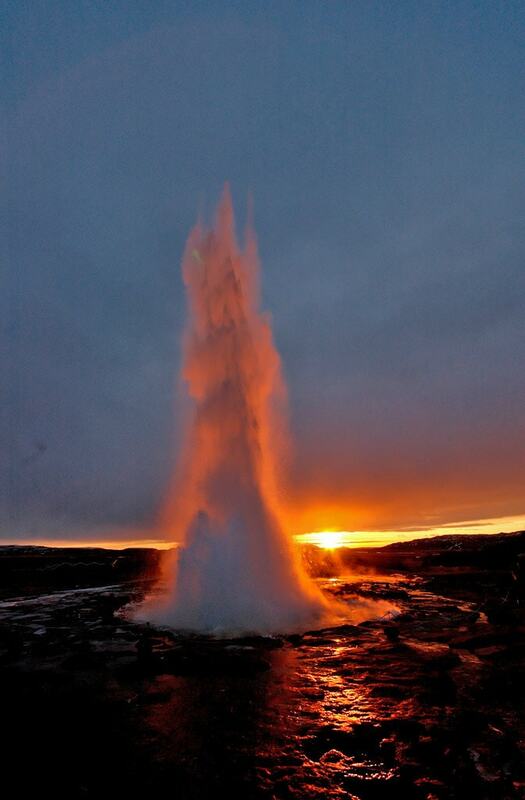 Currently Strokkur ("the churn") belongs to the most spectacular geysers on Earth. But not always it has been like this – sometimes around 1900 it seemed to be extinct. Strokkur is the main attraction in the beautiful Haukadalur geothermal area. In fact this is the only reliable geyser in this famous geyser field. Every few minutes it forms some 10 – 20 m tall fountain, first starting with an unique bubble. Sometimes fountain is even 40 m high. After the eruption the pool of geyser is emptied – but it quickly (even in 10 seconds) fills up. Before the eruption the pool is pulsating up and down and then a pulse of steam pushes the water upwards, forming a weird bubble with steam visible through it! The steam breaks the bubble and eruption starts. For most part there is one powerful burst, but there may happen several bursts as well. 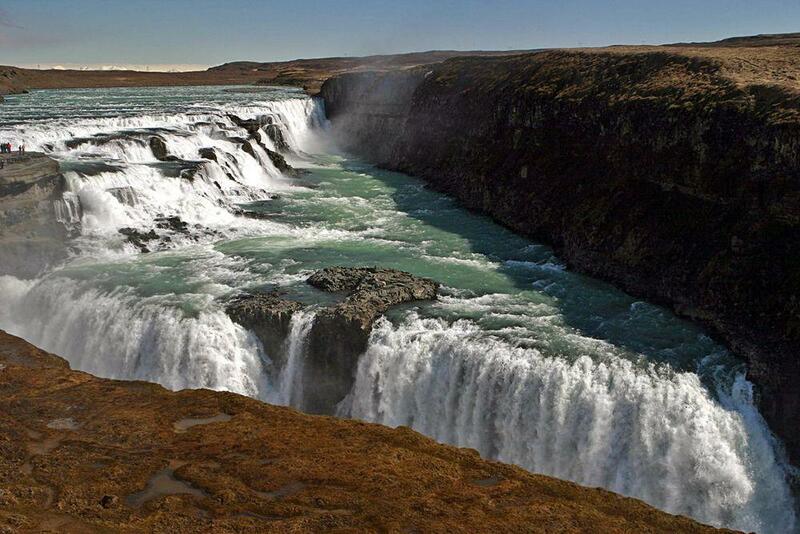 Although now Strokkur is very active, not always it has been like this. 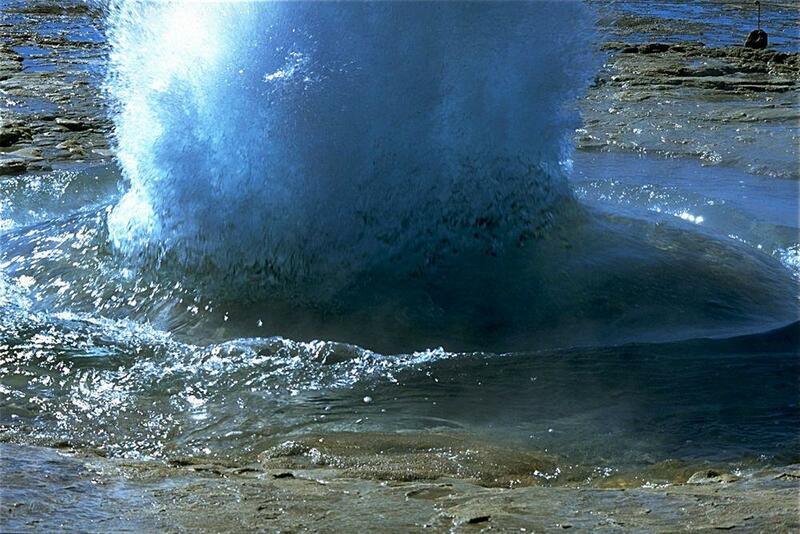 This geyser was first noticed in 1789, when after an earthquake it was erupting up to 40 m high. According to reports of several scientists the power of eruptions fluctuated in the 19th century. In 1810 George Mackenzie reported that Strokkur is some 20 m high and eruptions were lasting for half an hour. In 1815 Henderson estimated that it is even 60 m high. Professor Bunsen in 1846 estimated it to be 50 m high. 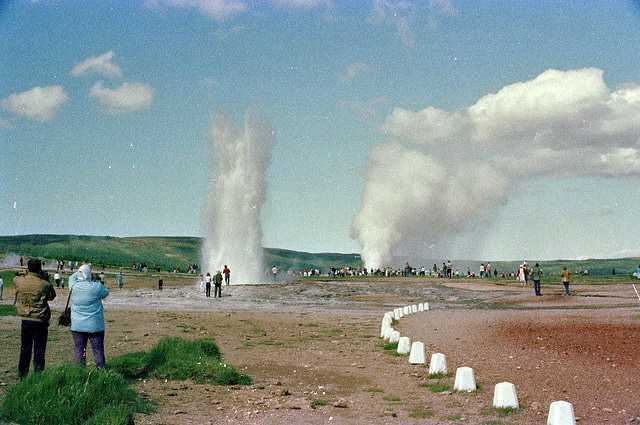 At the end of the 19th century geyser increased its activity. 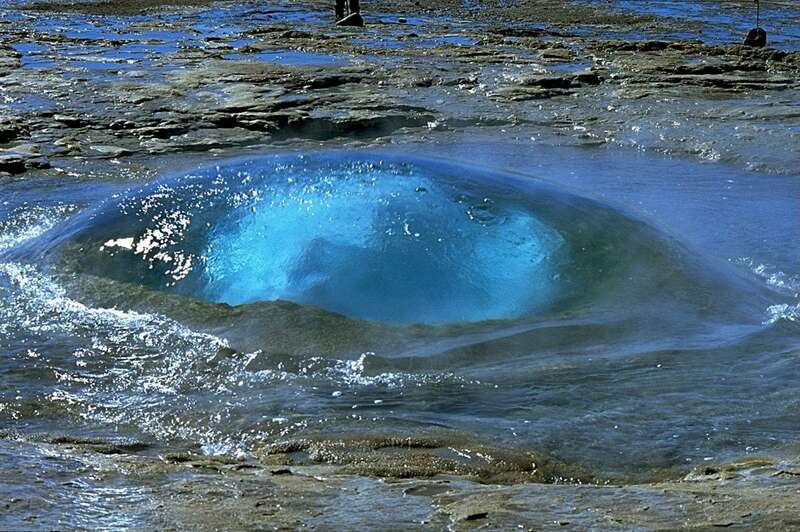 Earthquakes at the turn of the 20th century made Strokkur silent – just a steaming hole wit water deeper in it remained. 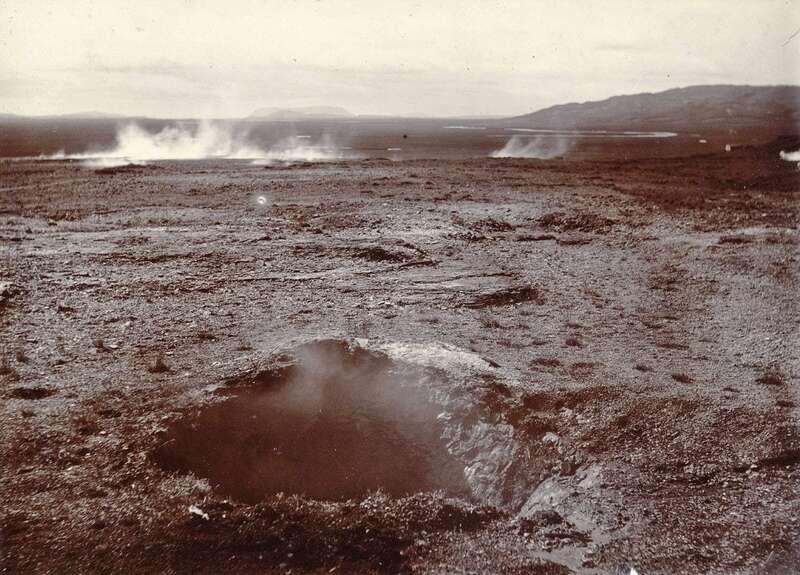 It remained like this until 1963 – then the vent was thoroughly cleaned with a drill up to 40 m depth through the bottom of its basin (as advised by Geysir Committee). 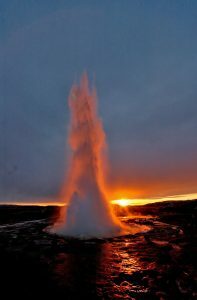 This action was very successful – since this time Strokkur is the main attraction in Haukadalur, with its spectacular and frequent eruptions visible for afar. Suzan Pasvanoglu, Hrefna Kristmannsdóttir, Sveinbjörn Björnsson, Helgi Torfason, Geochemical Study of the Geysir Geothermal Field in Haukadalur, S-Iceland, Proceedings World Geothermal Congress 2000. Accessed on July 12, 2011. Robert Allan, On the condition of the Haukedalr Geysers of Iceland, July, 1855. Míla Webcamera with both Geysir and Strokkur visible, accessed on July 15, 2011. Looks great!